So you’ve just bought a brand new caravan. You might have spent months researching your purchase and perhaps a few months waiting for it to be built and delivered. But finally the wait is over and your brand new van is ready to be picked up. How exciting! Having just gone through this ourselves, we know how much information there is to take in. This is especially true if you have never owned a van before. So we hope you find our tips for picking up a new caravan useful. Picking up your new van is very exciting. You’ve completed all the paperwork and the salesman is walking you around your brand new caravan. This is when you need to listen and watch carefully. They are going to show you all the important things you need to know. Plus a lot of little tips and tricks from experience with this van, that is now yours. Depending on the model and the extras that you may have ordered, this may turn out to be a lengthy process. If you have had a van before then you may already know a lot of what he or she is going to talk about. During this time, if you have any questions, it doesn’t matter how silly you think they are, you need to ask them. If you are not sure about anything at all, just ask. Paying attention now may save you some anxiety in the weeks to follow. The van is probably all opened up, bright and airy, lights on, hatches open and ready to show you through. As you walk around the outside, talk about how to properly secure everything for towing. 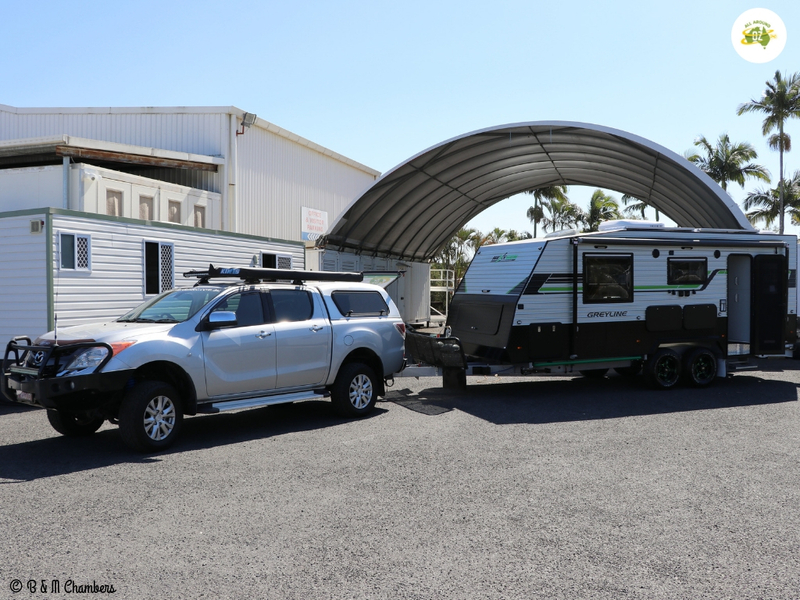 How access doors are secured and how stabilizers are operated, where things are stowed. Simple things like how to put the awning out and retract it back in can save frustration later. Remember to listen well, take notes if you like and ask questions. On delivery your salesman should show you how things like the awning work. Now we get inside. You are learning about the power management system and what all the switches do and the basics of your van. Things like how internal doors, such as the shower screen need to be locked for travel. How the TV antennae is operated. How your fridge works and what it is running on now and what you will run it on as you move. Learning how all the drawers and cupboards lock. How windows open, close and secure. You will learn how internal hatches are operated and how your hot water system works. Ask questions, nobody is going to care if you are taking notes. If you haven’t had much to do with vans before, there is much to take in. 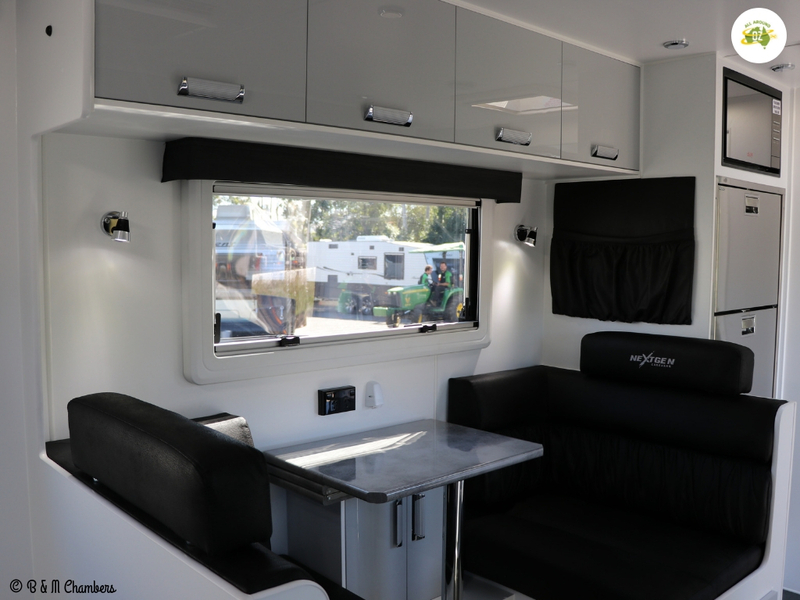 Getting to the know the inside of your new caravan is as important as getting to know the outside. These are just the start and will vary with different trailers. You will get a system that you are confident with, can walk through quickly and refined for your caravan. Hooked up and ready to go for the first time. Now the fun begins. It’s official. You’re about to drive out of the yard. Before you move away, apply the trailer brakes fully by hand with the brake controller. Gently try to move the vehicle. If it doesn’t want to move, fantastic, the electric brakes are working. Release the brake controller, gently try to move away again. It should roll with no resistance, great, they have released properly. This is something you should be in the habit of doing every time you hook up to a trailer with electric brakes. To find out they are not working in an emergency situation is to late. You need to know before you move away. Ok, off we go. Take it steadily for the first half hour or so. Concentrate on what you’re doing. Get the feel of it. Know where your van is sitting on the road. Always travel to the conditions and your capabilities. You will get to know how your van “feels” while travelling. If this feeling ever varies, even slightly, it could mean there is something wrong or about to be very wrong. If you sense a change in the feel of your vehicle, pull over and do your walk around. It could save a component completely failing. When you move off for the first time you will want to make sure that your electronic brakes are working correctly. This is something you should do with a new van, a second hand van, a trailer that hasn’t moved for a while, something you haven’t towed before or just for piece of mind. After 30 minutes or shorter if you are in heavy traffic, find somewhere safe where you can pull up with enough room to walk around your vehicle. Hop out, start from one point and do a complete loop around both vehicles finishing back at the same point. You are looking for things that may have come loose, things that are open that should be closed. Making sure everything is where and how it is supposed to be. You are smelling for hot strange smells. Maybe the brakes are dragging a little, or a bearing is a little tight. Be careful and feel the wheel temperature, don’t grab them. Touch them lightly at first to feel if the heat is excessive. Wheels can get very hot if a brake or bearing is dragging and can give you a serious burn. The centres of all the wheels should be close to the same temperature. You are listening for anything that you think is strange, not right. This is a habit I have for every time we pull up somewhere. It takes 30 seconds to walk around the vehicles and it may save some grief, time and money further down the track. The TARE weight of your van will be listed on it’s compliance plate. This should be located in either the front boot, the tunnel boot or on the A-frame. Keep in mind that the TARE weight is the bare weight of your van before accessories such as solar panels and additional batteries are added or water tanks are filled. To make sure that you can legally tow your van, we recommend that at the first available opportunity you take your van and get it weighed. Do you know what the weight of your new van is? Remember the TARE weight is the BARE weight. A great idea after you collect your van is to go for a short trip somewhere. Often called a ‘shake-down’ trip this is your chance to really get to know how everything in your van works, without the pressure of travelling to far from home. We did two shake-down trips. One where we free camped to make sure our solar and battery system was working. The second trip we chose a powered site to make sure all that side of things worked properly. Taking a short trip or two after you pick up your van is a great idea. Buying a new caravan is a little like having a new house built. There are bound to be a few ‘teething problems’. If you identify a problem, make a note of it. Your dealer should want to carry out a routine service after your van has travelled 500 to 1000 kilometres and this is the ideal time to address any issues. We hope these tips help you when it comes time for you to pick up your new van. You will be counting down the days until February Steve. Enjoy your new van!